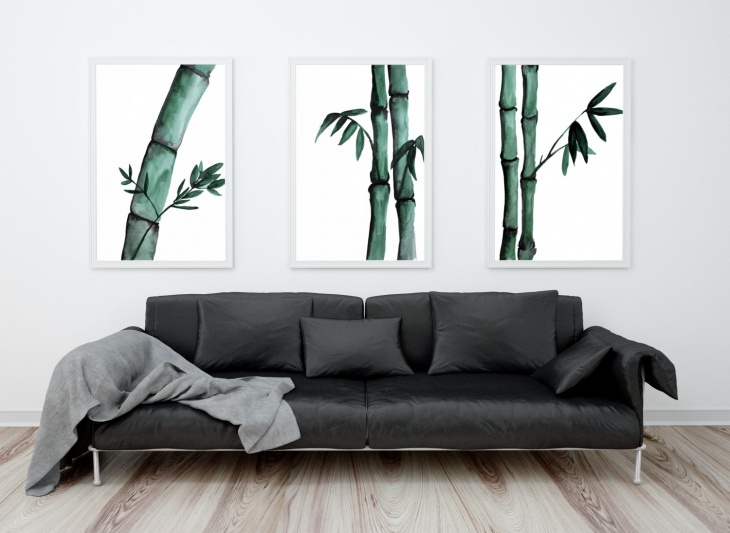 Have you been eyeing a bamboo art on the wall of your living room for some time now? Bamboo décor can bring in an unusual charm into the space. 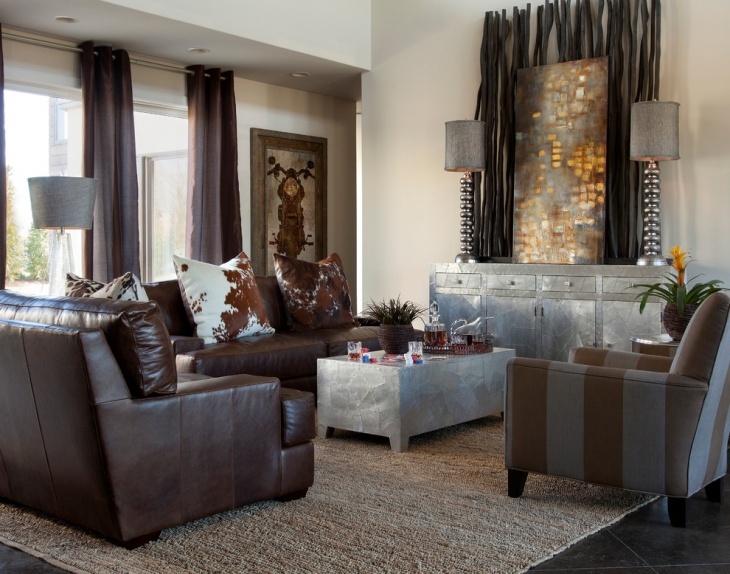 As a rustic piece of artwork on the walls, it comes in a large selection of designs that suit a range schemes. 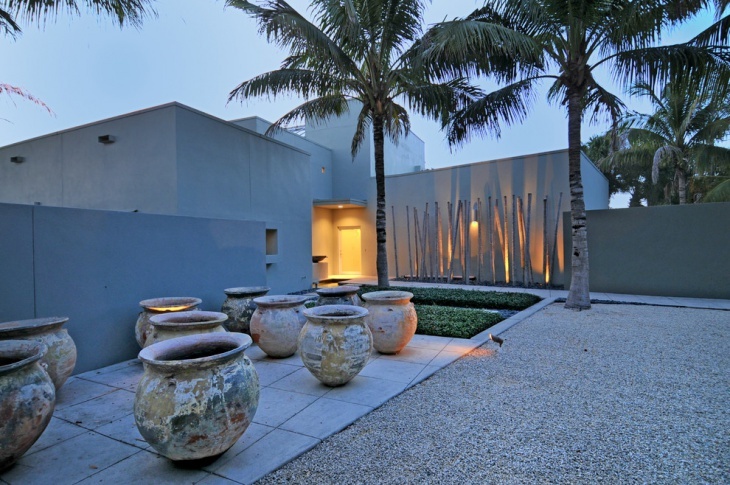 Easy to apply, they make both modern and traditionally designed apartments evoke a sense of luxury and creativity. Further, bamboo art is perfect to be put up in all kinds of spaces – living room, bedrooms, study, kitchens and even your bathroom. Here are some unique designs that should help your choices. If you are not looking to bring real wood into the household, these decals will be the perfect alternative to bring in the natural rustiness. Looks cool on a big blank wall, they can perfectly liven up the space and you will not have to spend time and money searching for other ways to do more with the wall space. In this case, the bamboo decal comes in a subdued vinyl finish. The designer has been able to beautifully bring out the rustic effect of the decal without entering into unnecessary spaces. Well if you are looking for colorful green decals, you can always have a bright background to go with it. This is a really unique piece of wall décor. 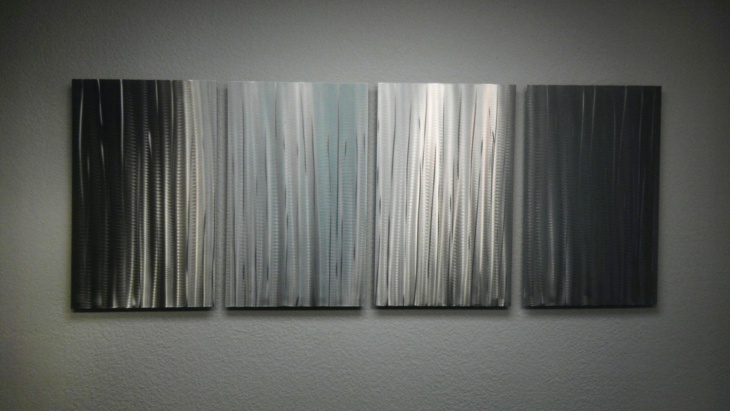 Made out completely from metal, they can be put up high on the walls for an interesting addition to the space. However, make sure that you keep them out of reach of children and pets. The metal edges can be quite the risk! 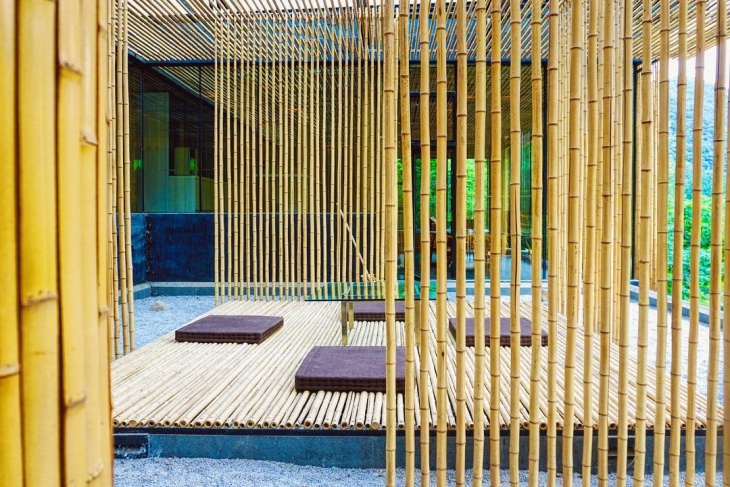 The Japanese has been first to integrate bamboo soulfully into their home décor. A couple of green bamboo sticks can make a lot of difference. 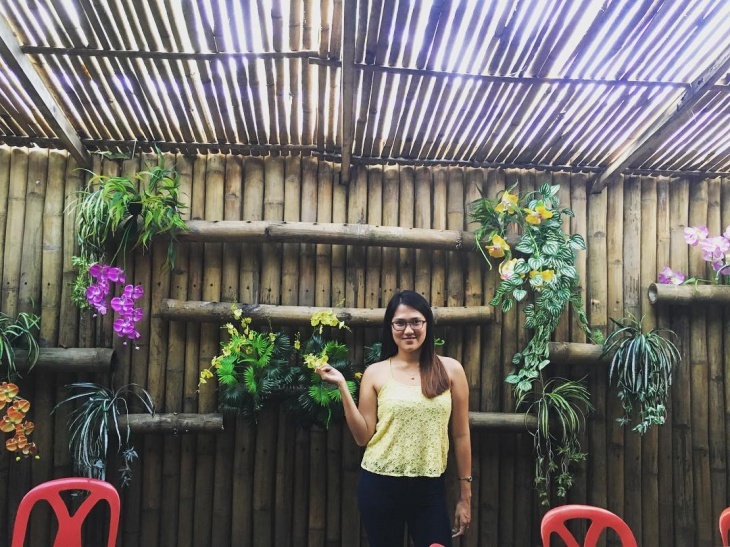 You can even go for a bamboo bonsai to create a completely new look. The tender green branches are always a welcome sight. In this example, bamboo has become the theme of the canvas art. The patterns and textures a bunch of bamboo shoots make is challenged by none. A life size canvas of such a bamboo forest can be a unique addition to your bedroom. 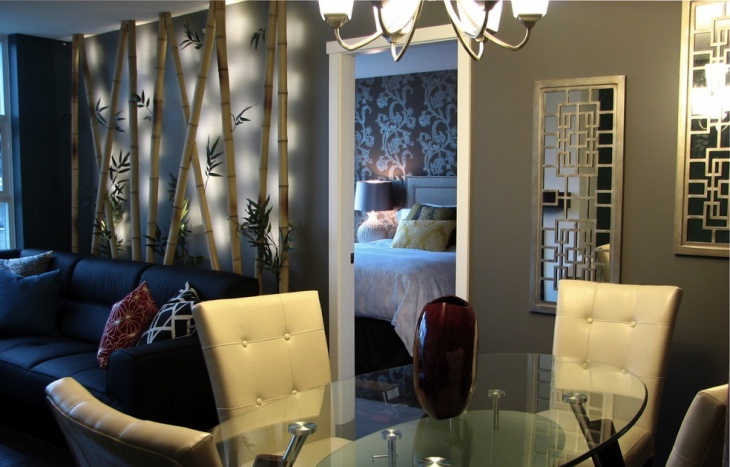 Here, the interior designer has put in a lot of creativity in bringing a bamboo installation to life. Made from real bamboo, the arrangement can both act as a perfect background for your tea party or even help define a separate space in a room. You can compliment it with a straw textured floor mat and other small décor items as shown in this example. If you are trying to come up with a seriously exotic and sophisticated interior design theme, bamboo can be a well placed material. 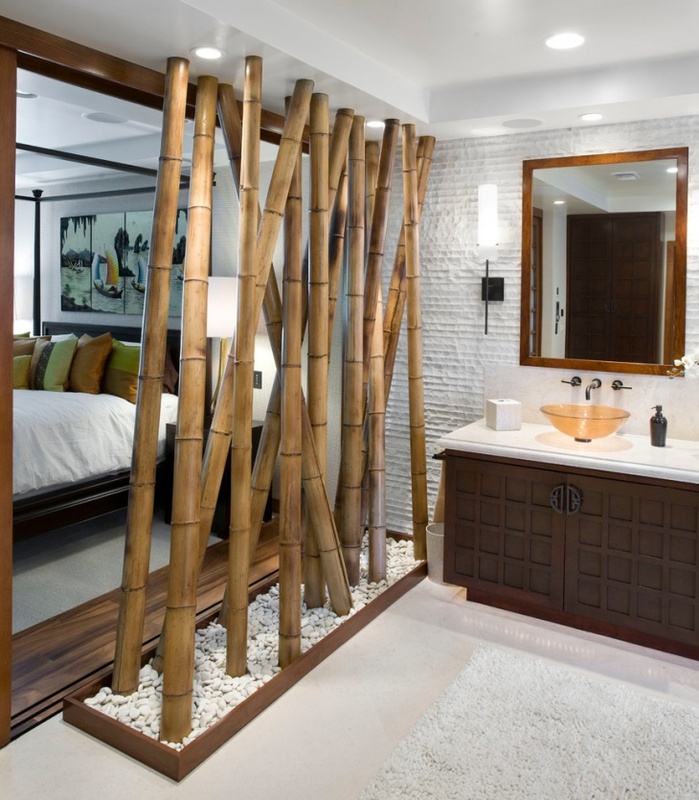 In this example, bamboo poles have been beautifully integrated into the luxurious bathroom space. With the right type of lighting, you can achieve awesomeness! 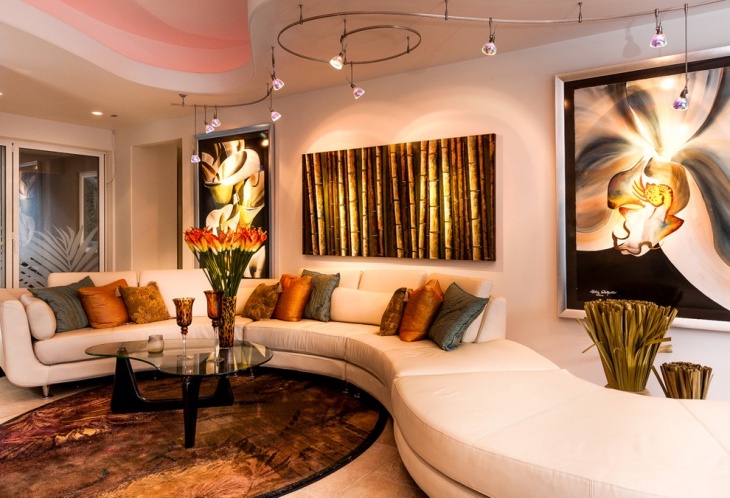 Bamboo art can become a unique element in your living room space. 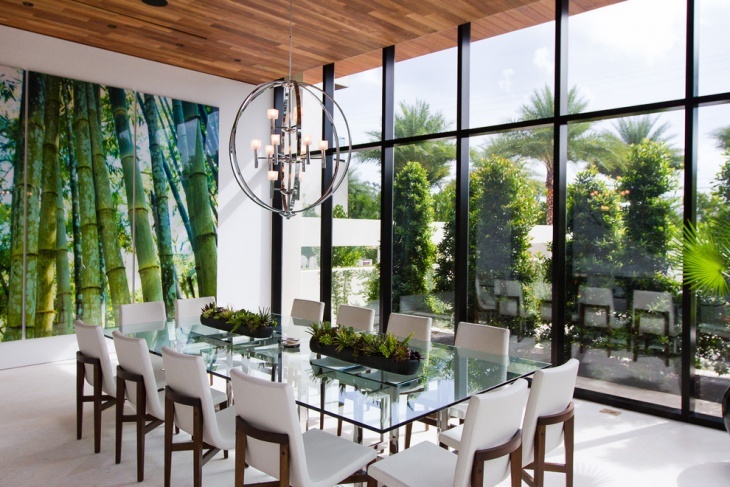 As shown in this example, bamboo decals and real bamboo poles create an interesting backdrop for your conversations. Make sure you are lighting up the space well. 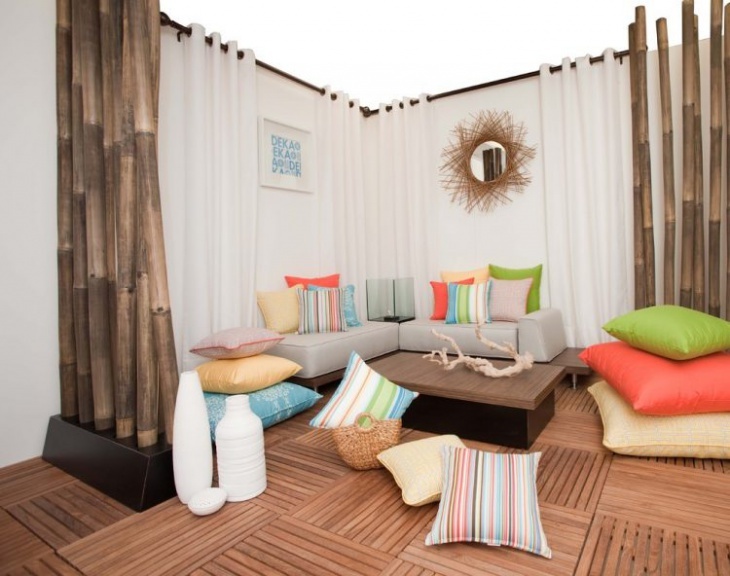 Bamboo can be used to create a highly functional addition to your outdoor space too. They can be your doors; they can act as a unique theme for your boundary and even create a barricaded space that looks interesting from outside. 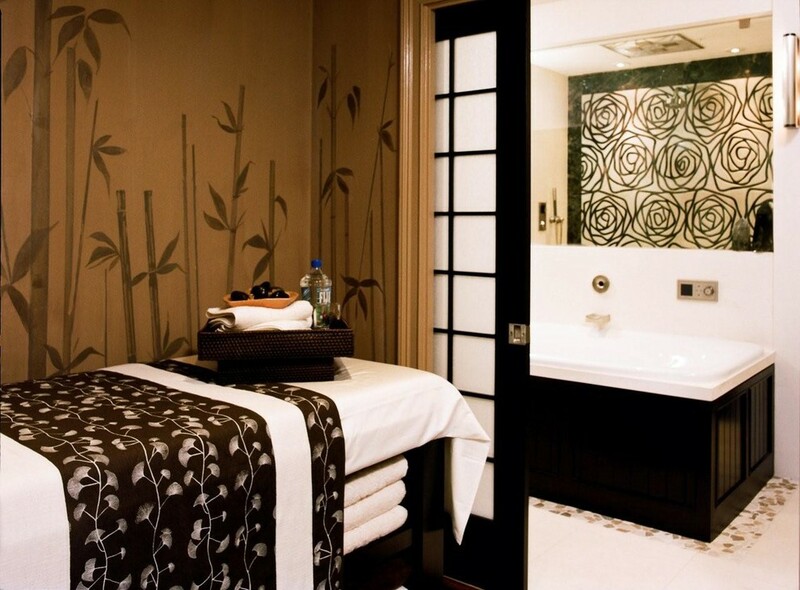 Bamboo is available in a variety of rustic textures that can be interestingly put into interior design. 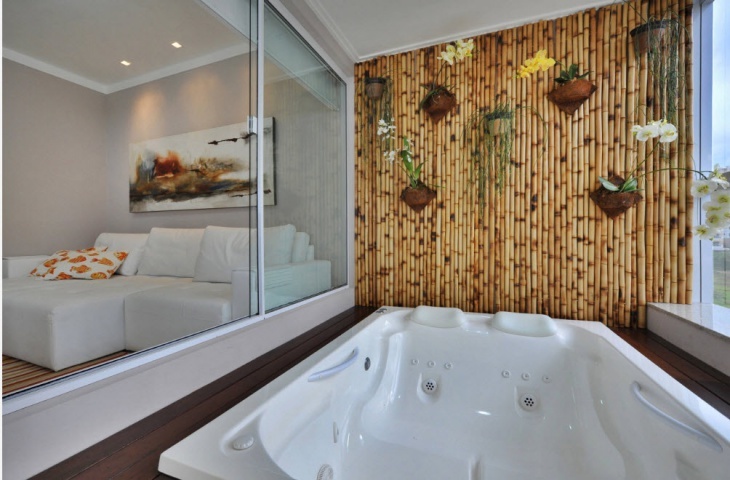 In this case, the rich texture is well complimented by hanging plants, making a perfectly romantic bathing space! 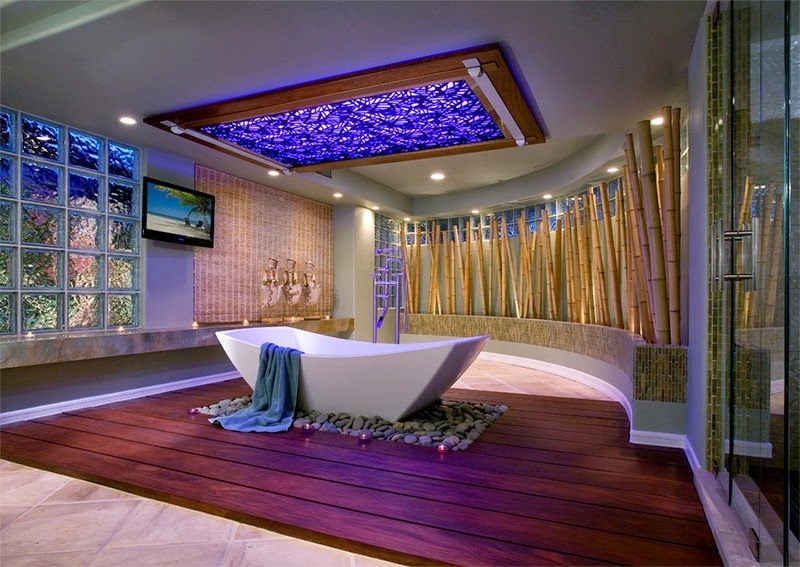 This would be perfect for your private bath. We hope that you will carry back some of these ideas to implement in your own household. 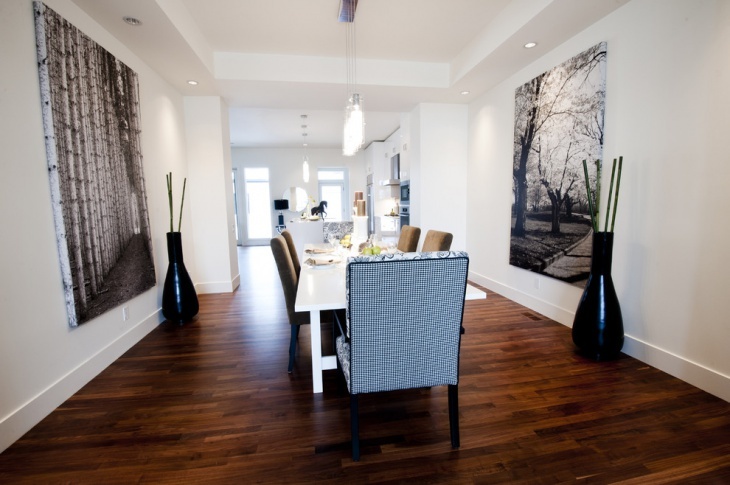 Bamboo facilitates a lot many décor schemes. Do share your ideas and feedback!